Tiban wells that appeared in an old people's homes Hadi Wijaya (49) on 9th Street Magersari Simo did not appear suddenly. Hadi strong belief that if the well Tiban appear after his brother's death, Barbara Mario (35) at 1 Ferbruari ago. "The source of this water comes after the death of my brother," said Hadi told reporters at his parents' house, Simo Magersari Road, Monday (15/3/2010). Hadi told the beginning of the emergence of Tiban wells. When his brother died, Hadi was in his lelaku (ritual) undergoing in the area south of Malang. We heard the news, Hadi has 2 choices. First, come to the funeral with the risk of breaking up from lelaku and the second is continuing lelaku long lived. "Finally I decided to continue lelaku. If I push it back, anyway I might not have time to watch my brother is buried," Hadi added. A few days later a new Hadi could go home. 7-day warning when her brother's death, his brother Hadi prays that these four numbers can go to heaven and be forgiven all his sins. Suddenly, the boy's father got 5 wangsit (whispers) if under the floor where he prayed buried treasure his parents owned. "It says there on the 3rd floor of the heritage where I pray. The floor is a room used to be my parents," said Hadi. In wangsit was mentioned also the case when in the form of 3 heirloom keris has a name, Pamengku Bumi, Naga Sasra and Samber Nyawa. Hadi himself believed it was his father's heritage, Marsaid, which used to be a fighter against invaders. But when will be taken, Hadi get a mention wangsit again if heritage is guarded by a Suromenggolo. The inheritance let Suromenggolo was taken but with the condition. Hadi must provide offerings of the head of buffalo, chicken smooth white fur with feathers and cone upside down. Buffalo head earned in Lumajang earned while in Lamongan chicken. "The offerings were then I float on the beach near the bridge Suramadu Madura. When floated, beach in low tide, so I had to walk 2 km then take the boat," said Hadi who is a trader. After the offering floated, 4 tiles on the floor are suddenly broken. Curious, Hadi was unpacking his own floor. When disassembled, it was found in 7 rows of red bricks stacked cross compiled. After the last brick, there is taken before seen ground. When the land was dug up, Hadi was surprised because the water suddenly came out of the ground. Water continued to flow despite the already depleted. Heritage, of course, is not found, but instead of Hadi had a round black stone. "It's been great but 7 buckets of water continued to flow," explained Hadi. 7 days after the dig, Hadi had wangsit again. Wangsit was admitted if the water is useful but prohibited notified to others. When it was in self-hadi concerns arise, if the furrows were left alone, then people will see it as 40-day warning her brother's death. 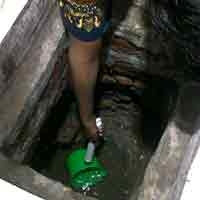 Therefore Hadi told a carpenter from Malang who also still relatives to make the hole did not look like wells. So a lid that was made to disguise the hole dug in the floor. "I told workers not to inform it of the water source to another," said Hadi. But what happens then is not so. Once the 40th anniversary of the death of his brother over, many people around who came to the house his parents are. They asked for water which is said efficacious cure. Do not want to disappoint people, who have come, Hadi was giving what people want.